Around this time last year, I made a post about helping the environment through a service called “Earth911″. This post isn’t about the environment, nor is it about woodworking, electronics, weather, or any of the other weird stuff you’ve come to expect from my writings. This is about helping the thing we all hold most dear in this life: ourselves. Readers in my audience who are on the techie side of things will likely have already known about this for years, but I also know I have others in my audience who are not. Normal, healthy proteins take on a shape called a “fold” during their natural course of action in a healthy environment. Protein mis-folding causes diseases such as Mad Cow, Cystic Fibrosis, Alzheimer’s, and some cancers, just to name a few. Here’s where it gets personal. My father-in-law (from whom I inherited all of the tools I restored), passed away at the age of 55 from complications of early onset Alzheimer’s due to a stroke. Two of my grandmother’s are breast cancer survivors, but 1 also has Alzheimer’s, and my grandfather has an ongoing battle with Lung Cancer. I am doing this to not only contribute to the research of these horrible diseases for their health and well being, but at the risk of sounding slightly vain and selfish, I’m doing it for myself, as well as my siblings, and immediate family. We’ve determined the risks for these diseases are abundantly heightened in our family. I’m quite sure I’m not the only one, otherwise Folding@Home would not exist. Now that you have way too much background on the “why”, I’ll go into the “what” and “how”. The “Folding @ Home” project (http://folding.stanford.edu/) harnesses the distributed computing power of idle computers on the internet to study protein folding. Stanford’s protein folding researchers have developed a desktop application that runs in the background of your computer and does “simulated protein folding” to glean the output of different scenarios they can’t observe in the real world in abundance. It would take 10,000 CPU days to simulate folding, one CPU alone doing it would take 30 years (folds happen in a matter of 10,000 nanoseconds). That’s unacceptable. With the computer power harnessed from idle CPU power, the workload is distributed and results are produced much faster in their simulated folding time line environment. I’m participating in the folding project by dedicating one of my idle CPU cores (I’m running a dual core) and as much available RAM as I can spare (I have 8 gigs total) to the cause while I do low CPU tasks like browsing the internet, listening to music, even as I write this article. You can participate, too. Go to the Folding@Home website, download the install program, which is very small, AND cross platform for all of you Linux and Mac users out there, install it, and turn it on. (There’s even a app for your Playstation 3!) I promise that you won’t even notice it’s there, other than the icon on your taskbar, which usually brings a smile to my face. Without sounding too cliche, “The life that you save may be your own”. I’m taking it one step further, though. Most of you will agree that if there were a kingdom where all of the subjects over-engineered and over-thought every little thing, I’d be a Prince. 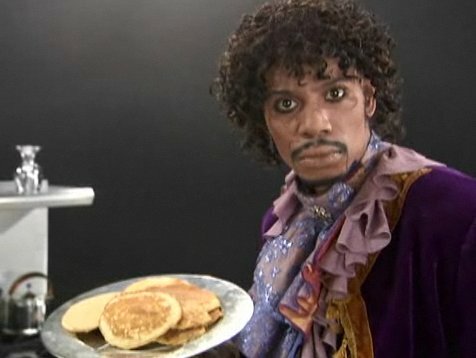 Probably not the purple velvet wearing, pancake making one, though. Now, I’m going to discuss how to get this running with spare CPU and memory on a VMWare server, so discontinue if this isn’t your brand of tech.